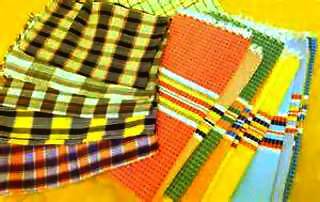 From traditional pillow cases, blankets and linens, ‘Abel Iloco’ re-emerged in the national market as material for classy home furniture and accesories. Dem Bitantes, an award-winning Filipino designer who participated in the Manila Furnishings and Apparel manufacturer’s Exchange (FAME), made use of Abel Iloco as a fine material for furniture and other home ornament. “We used the local cloth in accessories and furniture, like lamp shades and chair’s upholstery in order to show that Abel Iloco is an interior element with style and modern use,” said Bitantes. Traditionally, Abel was used for blankets, mosquito net, pillowcases, linens and other household garments. Products developed and now include table runners, placemats, napkins, dress materials, shawl, bags and other novelty items which were on display at the province’s tourism hub for “pasalubong” (gift). Today, the local cloth is being used for classy gowns and modern Filipinana as local designers’ way to promote the product. Earlier this year, Ryan Madamba, a designer from San Nicolas, launched his first ever Abellissima Fashion Show in Manila to support the abel industry of the province. ‘Abel Iloco’ or ‘inabel’ is a hand-woven textile done on traditional wooden looms by Ilocano artisans using weaving techniques. Manila FAME paid homage to the oldest global Filipino product which originated from the ‘Kumakaway’ town of Paoay, Ilocos Norte. During the Spanish era, abel was one of the top exports because it has been admired for its superior quality in terms of durability and design. The number of traditional weavers, however, is declining. Out of 32 barangays in Paoay town, only three communities are into abel weaving.